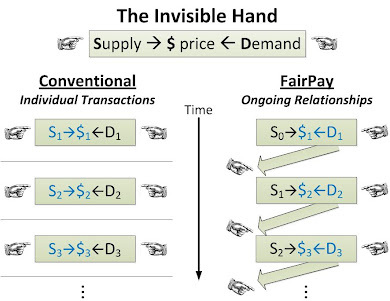 Video is now online at ISSIP from my 10/14/15 presentation on FairPay. ISSIP is the International Society of Service Innovation Professionals, "a professional association co-founded by IBM, Cisco, HP and several Universities with a mission to promote Service Innovation for our interconnected world." I was introduced to ISSIP when I met Jim Spohrer of IBM, one of its founding board members, at the Naples Forum on Service in June. Jim immediately saw the appeal of FairPay, and how it embodies many of the principles ISSIP is helping to illuminate. He has been very supportive in introducing me to the ISSIP community. That led to this presentation, which was facilitated by Haluk Demirkan of the University of Washington. As my still-formative and inexpert encapsulation of how FairPay fits with service science and Service-Dominant Logic (S-D-L), these teachings suggest that much of our conventional thinking relates to "Goods-Dominant Logic" that developed over the past centuries -- "yesterday's logic." But now we are in a service economy, and are beginning to recognize that goods matter only in enabling a service -- for example, a nail has little value in itself -- its value is in how it provides the service of fastening, in a particular use and context. The value of a service is understood to be "co-created" by the provider and the consumer in its particular use-context. On the video, after the talk, is a few minutes of Q&A, with some very interesting questions. Competing on Customer Journeys is a very interesting article in the 11/15 HBR that presents an emerging marketing paradigm, one that provides just the context for a further step of proactivley ensuring the journeys are maximally win-win. The subtitle is "You have to create new value at every step" -- my work on FairPay suggests a way to enrich the customer journey to do that much more explicitly and effectively. Rather than merely reacting to the journeys that consumers themselves devise, companies are shaping their paths, leading rather than following. Marketers are increasingly managing journeys as they would any product. Journeys are thus becoming central to the customer’s experience of a brand—and as important as the products themselves in providing competitive advantage. They suggest how this can enable "a 'loyalty loop,' ... a monogamous and open-ended engagement with the firm:"
Without this added step, the loyalty loop does not fully realize a central driver of engagement and loyalty -- a proactively personalized value proposition that is win-win for both the consumer and the firm. Without this we just perpetuate the idea that the firm decides on value propositions and tries to coax consumers into accept them. 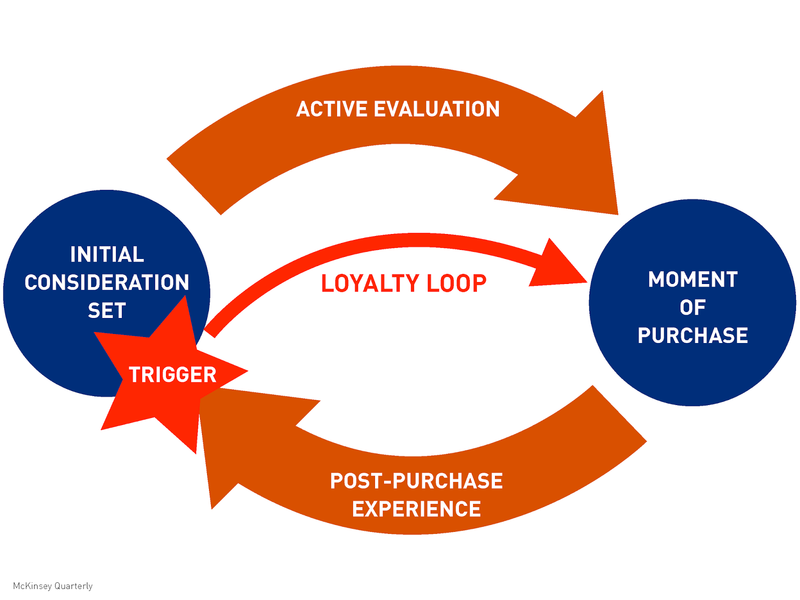 Adding explicit value assessment into the loop engages the customer more deeply and enables the firm to serve the customer far more effectively. This participative element builds consumer loyalty by demonstrating the firm's commitment to learning exactly what each customer values in varying contexts, and seeking to deliver it by customizing the value proposition to match. We’re now seeing a significant shift in strategy, from primarily reactive to aggressively proactive. Across retail, banking, travel, home services, and other industries, companies are designing and refining journeys to attract shoppers and keep them, creating customized experiences so finely tuned that once consumers get on the path, they are irresistibly and permanently engaged. Unlike the coercive strategies companies used a decade ago to lock in customers (think cellular service contracts), cutting-edge journeys succeed because they create new value for customers: Customers stay because they benefit from the journey itself. 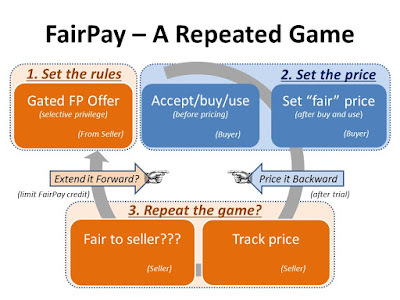 As emphasized on this blog, the driving goal of FairPay is to make price=value, over time. When it comes to value propositions, firms remain coercive, effectively saying: "We give you this value package for this price. If you don't like that, how about this other value package for this other price? If none of our options suit you, we are not listening -- you will have to settle or go elsewhere." FairPay dialogs about value open a new dimension of adaptivity and dialog to personalize value propositions based on individual context, needs, and value perceptions. 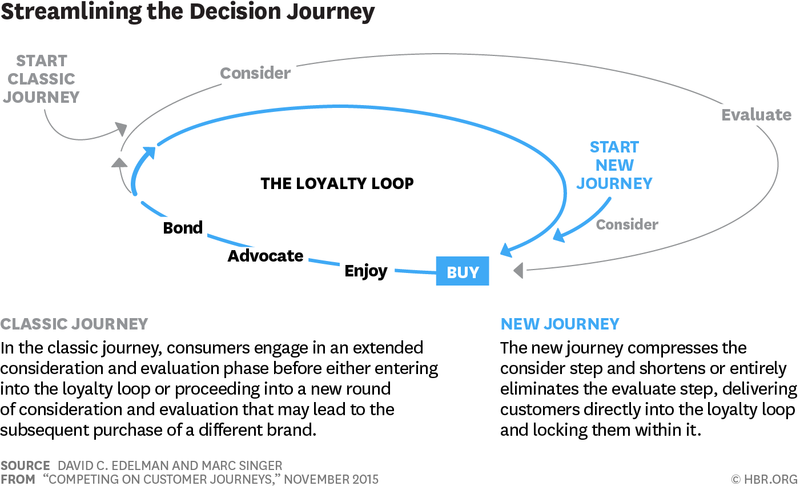 These dialogs about value become central to the journey, and a key driver of the loyalty cycle. How that is done is shown in the sidebar, and expanded on in the Overview and More Details pages. Sungevity is ... using what it knows about its customers to extend the journey... With granular data on each household’s energy use and habits, Sungevity can advise people one-on-one about managing their energy consumption, and it can recommend a tailored package of products and services to help them reduce their dependence on the grid and reap savings. ... Ultimately, the firm plans to integrate its services with home-management networks that can automate energy conservation (adjusting lights and heating, for example) according to decision rules that Sungevity develops with each customer. Another project is to create conservation-oriented customer communities. The value step I propose would bring value pricing into this journey -- in a uniquely simple and lightweight form -- to enable Sungevity to evaluate the savings their services actually deliver to the customer, and to engage in dialog with the customer to share a portion of that value with them. Rather than expecting the customer take a risk that they will get a predicted value, and discounting the price they are willing to pay to allow for that risk, Sungevity can design the journey to share the risk, measure the realized value, and share in that value. Examples of how effective such value pricing can be are in this other HBR article. FairPay is a very natural extension to the customer journey perspective. Edelman and Singer explain that "The move from selling products to managing a permanent customer journey has required mastering the four capabilities that all companies will need to compete: automation ...; personalization ....; contextual interaction ...; and journey innovation .." The same four capabilities support FairPay as well. 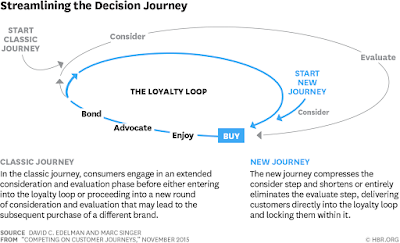 As the new "logic" of customer journeys becomes accepted in marketing, the related new "logic" of FairPay" and its adaptively win-win value propositions should become increasingly accepted as well. Different levels of FairPay empowerment may be applicable to different consumers and different business contexts, but a more explicit focus on value can benefit almost any customer journey. Tipping in restaurants made the news this week, raising many questions about "fair pay" the social movement toward fair wages -- but also bearing on the very different issues of "FaiPay" the new strategy for value-based consumer pricing described on this blog (and outlined on the Harvard Business Review Blog). The news is that the prominent NYC-based Union Square restaurant group is phasing out tipping entirely in most of its restaurants (Union Square Cafe, Gramercy Tavern, The Modern, ...). This is a very complex issue, as noted in the NY Times article on 10/15/15, including issues of customer service, fair wages for labor (the "fair pay" issue), economic policy (do minimum wages apply to tipped workers) and even tax policies. As described in other posts and the sidebar, FairPay is a strategy for setting prices with user participation, having elements of pay what you want (PWYW) that are much like tipping. What FairPay adds to PWYW is that it is applied in the context of a relationship that continues only as long as the payments are considered fair by the business. Thus the consumer can pay any price they want for a given transaction, but the business can decide to stop offering FairPay transactions to a consumer who they consider to be free-riding. That gives the consumer strong reason to pay fairly, to maintain that privileged relationship. This works very much like restaurant tipping -- especially in the case of diners who might be regulars at a given restaurant, and thus concerned about their reputation for tipping fairly, and how that affects their ongoing relationship with their servers (who may provide less service to those they feel were unfair, and superior service to those who are generous). 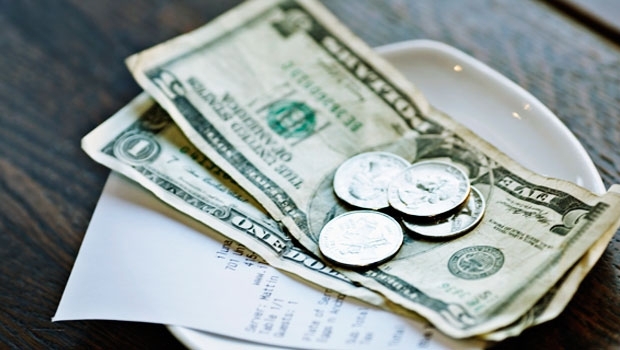 So the behavioral economics of tipping, and of PWYW, are very relevant to FairPay. My focus here is not on the complex issues of wage equity in restaurants, but on the behavioral economics of the FairPay model -- as applied to other kinds of value exchange -- how tipping sheds light on broader issues of customer value propositions. Still more broadly, these are questions of the overall effectiveness of how businesses relate to their customers, and the processes for determining how value is shared among consumers, businesses, and workers. The essence of FairPay is the idea that price should correspond to value -- as actually experienced by the customer in the full context of that experience, as it evolves over the course of the relationship. It is based on open dialog and transparency about the value exchange, the costs, and the economic value surplus that is "co-created." If the parties behave fairly, this lead to economically optimal pricing that produces the greatest overall value for all. The details all have to do with getting that fair behavior. Many customers remain deeply attached to the right to reward attentive service, or to withhold that reward. And servers often say that the bonanzas they take home after busy nights far outweigh the risk of getting nothing once in a while. By increasing prices and ending tips, Mr. Meyer said he hoped to be able to raise pay for junior dining room managers and for cooks, dishwashers and other kitchen workers. Compensation would remain roughly the same for servers, who currently get most of their income from tips. Under federal labor laws, pooled tips can be distributed only to customer service workers who typically receive gratuities, and cannot be shared with the kitchen staff or managers. Much of that was news to me, in spite of having tipped in NYC restaurants many hundreds of times over many decades. My impression was that it was the servers who got the tips, not the kitchen staff (but I was not sure if that was always true), but I still have no clarity on whether my tip goes to my waiter alone, to all waiters, or to other service staff (which I presume varies with the restaurant). Makes it hard to know what is fair doesn't it? Without knowing who my tip goes to, it is hard to be fair. But if I know what goes to my server, I have a pretty good sense of the fairness of that (as long as I am cognizant of the common "reference price" that 20% is fair for a normal level of good service). Another aspect of transparency is that the "dialog" about value in a restaurant is very limited. There is the service and the tip, and maybe some polite chatter or body language, but that is about all. It is rare that either party communicates specifics as to why a given tip might be fair or not. 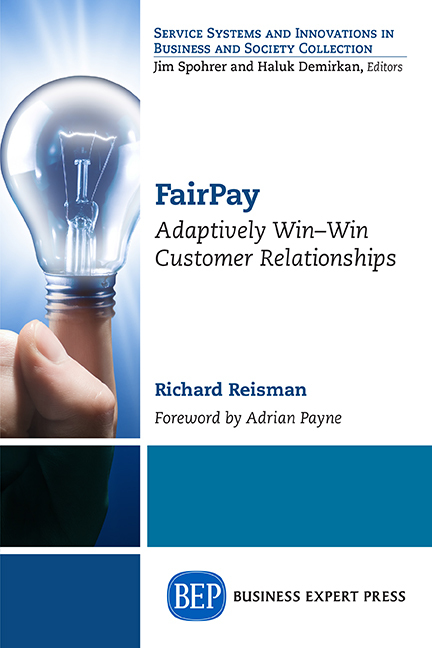 FairPay suggests that convergence on a mutually desirable exchange will be most effective with clear dialog on what is or is not working with all aspects of the value proposition. That may well be awkward with a restaurant server, but it can be very direct with a business that uses modern computer-mediated dialog services such as feedback forms, and that invites and responds to such dialog. This begs the question of why take tipping away from those it works for? Tipped workers were clearly much better served than non-tipped workers. (As a reference point, the CPI increased 221% in the past 30 years.) Again, my issue is not whether tipping is good labor practice, but what this tells us about pricing models more broadly. It may well be that tipping is less effective in less high-quality, service-oriented restaurants (or where waitstaff may be at risk for abuse by customers or management). But it is those contexts where quality and service are key elements of the value proposition that I suggest are the prime opportunities for FairPay. Another thing that tipping teaches about FairPay is how easy it is for people to compute value intuitively. On hearing about FairPay in other contexts, such as for digital content subscriptions, people often ask "isn't it a difficult cognitive burden for customers to have to think about the value?" But tipping provides a clear answer -- this computation is not difficult -- it is highly intuitive. We easily do a complex multivariate, multi-dimensional analysis in our head, during and after a meal and know immediately whether we think the service was average, or better or worse, and by roughly what degree. We can then easily figure whether we adjust our average tipping level up or down, and whether to adjust for being a regular or any other special factors, to conclude that we should tip X%. Any computational difficulty is just doing the arithmetic of how much X% of the bill is (with or without tax, rounding, etc.). Other complications relate to whether our tipping is visible to others in our party that we might want to impress -- which is something that may or may not be relevant in FairPay contexts, and may not be much of a problem even when it is a factor. So all in all, it seems the behavioral economics of tipping is very supportive of the idea that FairPay will prove very effective in selected business contexts. Whether tipping can and should survive in restaurants -- given all of the unique social, labor, and legal issues involved -- is a different question. 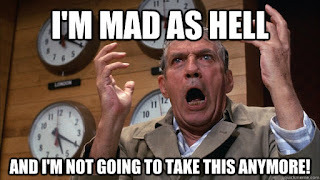 Media companies are in a panic over ad-blocking, as an existential threat, now that Apple has enabled it for mobile -- but this may just force the end of an era of consumer abuse deservedly left behind, and the beginning of a new era of win-win value propositions. Advertising strategies have become increasingly consumer-hostile, and that has caused consumers to say "I'm as mad as hell and I'm not going to take this anymore." While this may seem the end-of-days for publishers, we may just be turning a corner toward a much more effective blend of advertising and subscription models. What we need is a new and more collaborative, win-win mind-set. Apple's enabling of ad-blocking in Safari may be the coup de grace for current models. The recent PageFair/Adobe Ad Blocking Report shows how this has been growing over 40% per year for several years, to a loss of tens of billions of dollars, even before the new Apple support gives ad-blocking increased legitimacy. As my friend Bill Rosenblatt observed on Forbes, to publishers, ad-blocking looms much like piracy. Publishers have relied on ads to pay the freight, so consumers could buy their content at low rates. Some sites even have terms of service that make the contract explicit -- you agree to view our ads in exchange for access to our content. As with piracy, legal counters to prohibit ad-blocking are being sought by some. Bill referred to Digital Content Next (DCN, formerly the Online Publishers Association) as taking a more nuanced and consumer-friendly view, and a few days later, the CEO of DCN co-authored an interestingly balanced opinion piece on re/code (which contained the diagram above). Given no reasonable say in a value proposition they loathe, consumers react with subversion -- blocking ads, just as they react with piracy when they think content prices are rapaciously high. Consumers demand fairness from their suppliers, and if they feel it is not granted, they will seek to take what they feel they deserve by whatever means necessary -- a Robin Hood strategy. And why not? Do they get relevant ads? Do they get to choose how to balance subscription fees and ad load? Publisher have declined to give them any choice, but now the ad-blockers do. 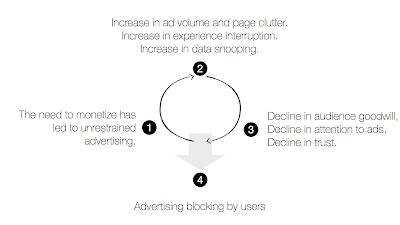 The whitelist features of ad-blockers provide new power to consumers to pick and choose their value propositions, whether publishers like it or not. A site with a reasonable ad load may get whitelisted, while one with a heavy hand gets blocked. ...ad blocking is endemic only because online advertising has become so invasive that hundreds of millions of people are willing to take matters into their own hands. 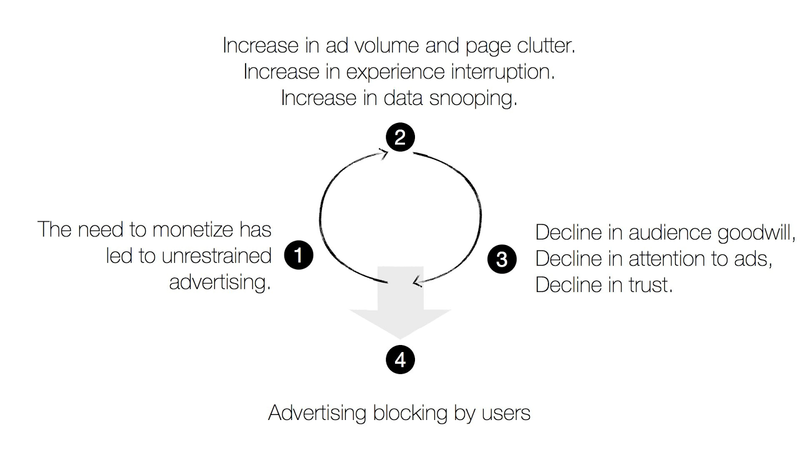 To sustainably solve ad blocking, we must treat these users with respect, not force feed them the popovers, interstitials and video ads that they are trying to get rid of. Sites which sign up for PageFair are given an analytics system precisely aimed at determining how many visitors are blocking ads, as well as a supplemental advertising system that displays adverts to adblockers only. The idea is that websites use those supplemental ads to ask visitors to turn off ad blocking software, appealing to their better nature and laying out the economic difficulty with operating in an environment where ad blocking is commonplace. The trend seems to clearly require that publishers reconsider their value propositions, and make them more transparent, personalized, and win-win. Any move in that direction will bring publishers closer to still more advanced models like FairPay, which apply adaptive processes to find personalized, win-win value propositions. Instead of arbitrary fixed prices for all you can eat (regardless of whether you eat a lot or a little in any given period), FairPay seeks prices that dynamically adapt to individual, time-varying usage patterns -- and the widely varying value-in-context that is received by each consumer at each point in time. Such prices are based on a new kind of value metering that acts as a flexible guide, not an oppressive sledgehammer. And it is a value meter that runs in both directions -- charges for value received, and credits for value given (such as in the form of ad viewing, personal data that can be sold, viral promotion, user-generated content, etc.). All of this is based on a win-win balance of powers. The Internet has leveled the playing field, and the sooner suppliers recognize that, the better for all of us. More about how this can work is in my recent post Patron-izing Journalism -- Beyond Paywalls, Meters, and Membership. To the extent that publishers make ads more targeted, relevant, and useful, they will make money on ads.To the extent they fail, subscriber fees will be their only option. Either way, adaptive models like FairPay that offer truly win-win value propositions tailored to each user promise to be the most efficient model for doing both. Why shouldn't the consumers have a say in how many ads they view? -- as long as they pay a fair price, whether that be in money or in attention. [Update:] See this more recent related post: Reverse the Biz Model! -- Undo the Faustian Bargain for Ads and Data.